Sintra Houses by Lendas de Sintra®, is pleased to announce its 2nd Thematic Workshop scheduled for October 6th, which will take place in the beautiful Sintra Mountains. The proposal will be to awaken and guide the participants to the graphic arts, in particular with regard to visual design. To this end, Sintra Houses counts on the advisor, Professor João Miguéis, a plastic artist who teaches at ar.co school and who collaborates in the coordination of the arts department of the Summer School, at St. Julians School. The route starts in Praça D. Fernando II (loff the fortnightly fair of S. Pedro) with a short walk towards the heart of the Sintra’s Moutain. The first stop to draw takes place in a privileged place, the private gardens of Villa Maria, overlooking the valley of S. Pedro, with breathtaking views to the Convent of Mafra. From there, you follow a pedestrian path, walking among the dense trees of Sintra, passing by the Castle of S. Gregorio and winding the mountain to the Castle of the Moors. At this stage of the Castle, we will have the opportunity to draw several views and unique landscapes, using the techniques of the spot and the trace, with the support and guidance of João Miguéis. All required materials are included. This is an event designed for all age groups, especially those who like to draw and who wish to learn about new materials and new techniques. 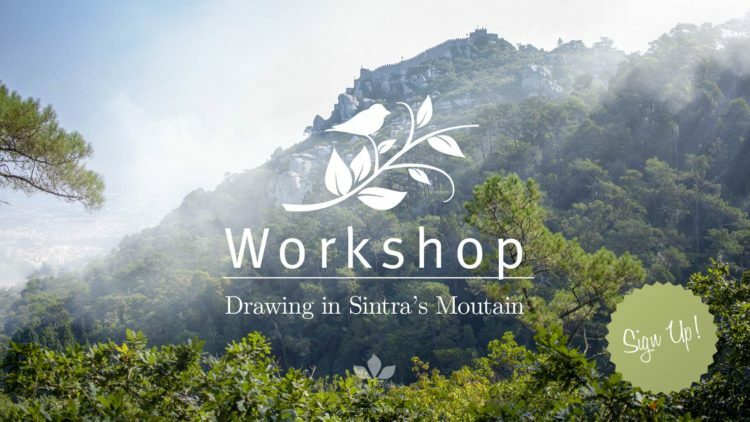 The drawing workshop will also allow Sintra lovers to discover new points of view and even discover lesser known corners of this fantastic mountain range.